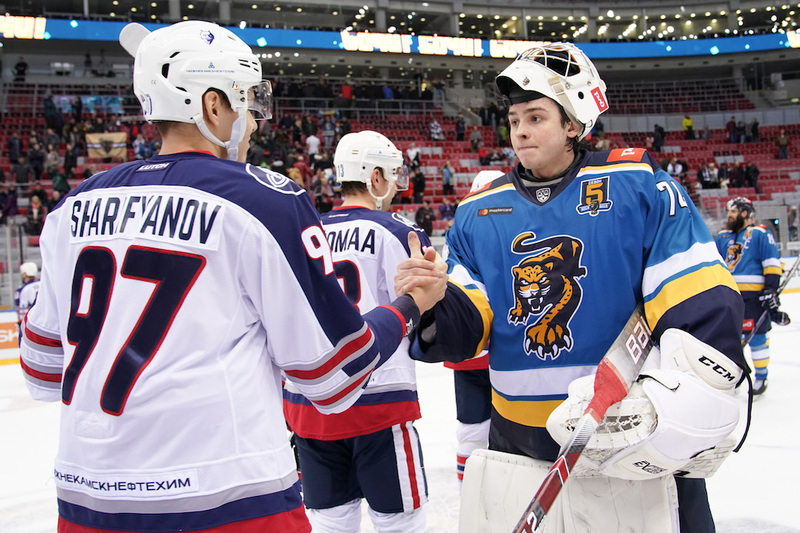 Pyotr Kochetkov played just two games in the KHL this season, but he’s already generated a lot of hype as one of Russia’s most talented goalies. 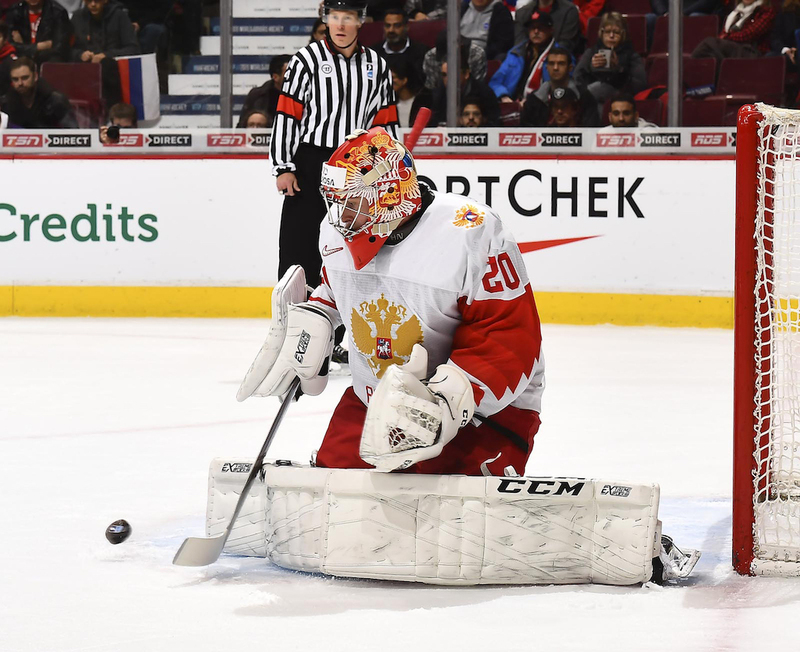 Over the Christmas and New Year’s holidays he guarded the pipes for the Russian team at the World Junior Championship, where he was recognized as the top goaltender of the tournament. It seems very likely that he could soon be discussed in the same distinguished light as Ilya Sorokin or Ilya Konovalov, two of Russia’s other young star tenders. The 19-year old HC Sochi goalkeeper has made a good start towards fulfilling his grand ambitions, and he hopes that his success at the World Juniors was just the start. For his parents, their son’s new ambition proved a little pricey. Even the goalkeeper himself recognizes that his mother and father helped him as much as possible, despite their difficulties. “I remember well how my dad bought me a new uniform and we had to sell a few things just to afford it,” says Pyotr. Kochetkov is also very thankful to his coach Andrei Agapov, who gave him an old jersey left over from his Penza sports academy. “Pet’ka did it all himself,” the coach says. “I gave him the ammunition, but he trained with other goalie coaches from professional teams all by himself, where he learned what it takes.” The Penza sports academy has a right to be proud of its 1999-born stars. That group includes not only Kochetkov, but also Klim Kostin, his partner from the Russian junior team. Six months ago, Kochetkov was still on crutches. At this point he probably could not have imagined that he would play in the World Junior Championship. “Thanks to HC Sochi, when things got bad, Petya got surgery,” says the goalie’s childhood coach Andrei Agapov. “Immediately after that he was already going to the arena in Penza, watching the games.” But after the season started, HC Ryazan become more and more interested in Pyotr. After a series of tryouts for the Russian junior team, the coaching staff of Valery Bragin decided to include him in the roster after all. The starting goalie for the tournament was Daniil Tarasov, but Kochetkov got his first chance in net by the second game, when the coaches put him in against the Czechs. He stopped 24 of 25 shots for a hard-fought 2-1 win. A few days later, the Russians fell by the same score to the host team, Canada. Kochetkov was again between the pipes for that match. He won out as the team’s starting goaltender for the rest of the playoffs, where the Russian team took gold. Kochetkov himself was named the best goaltender of the tournament. Throughout the course of the World Juniors, Kochetkov stayed in touch with HC Sochi goalie coach Jari Kaarela. After the tournament, Pyotr received a call from the team’s general manager. “We had a chat, and I told him that if I wasn’t going to get ice time in the KHL, it would be better to send me to the VHL, where I can improve,” he says. Born: June 25, 1999, Penza. Career History: Dizel (VHL) 2016-2017, Dizelist (NMHL) 2016-2017, Kapitan (MHL) 2017-2018, HC Ryazan (VHL) 2018-2019, HC Sochi (KHL) 2018 - present. Achievements: 3rd place, World Junior Championships 2019 (named Best Goaltender of the tournament).